I am 100% guilty of overpacking, even on camping trips (you never know what you’ll need!). So, this post is my own call to action and catharsis as well. 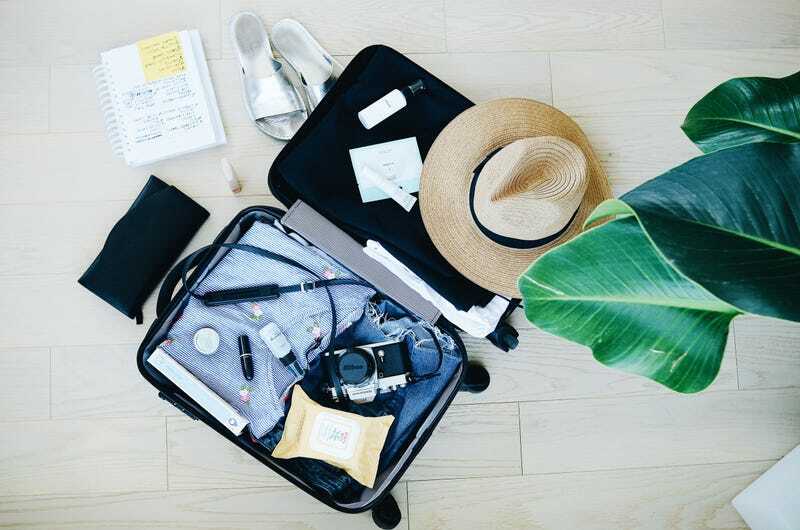 But there are so many versatile items out there that can be used in multiple different ways when you travel, which means you’ll have less stuff that you actually have to pack. Shoes that can transition between outfits, shampoo that can be used just as well as body wash, bags that transform into... other bags. The world is your well-packed oyster. I pretty much always pack a t-shirt dress, because it’s insanely versatile for a ton of different things. Wear this with sandals to the beach over a swimsuit, or sneakers around town, or right out of the shower when all you want to do is lay in your freshly made hotel bed. Swedish Hasbeens are some of the best shoes to walk around in, and they look pretty great with a dress, so you won’t feel too out of place if you end up at a nice restaurant or bar or what have you. I would HIGHLY recommend breaking them in first (or you’re in for a one-way ticket to blister hell), but they’ll last you through your whole trip and for years to come. I love this stuff and bring it with me every summer when I vacation in the Outer Banks. It’s shampoo and body wash in one, but not in a middle-school-locker-room sort of way. It smells amazing, brings moisture back into your hair and skin, and saves room in your toiletry bag. As I previously mentioned when the news was announced, this transforming backpack from Timbuk2 means business. It’s incredibly well-made and attractive in way that says “I travel for a living, what do you do?” It also allows you to only bring one extra bag on your travels. The detachable crossbody bag also gives you the convenience of a fanny pack without the embarrassment. Another toiletry bag slim down is picking up a cleansing stick. This stuff acts as a makeup remover, cleanser and toner all in one, so it’ll cut down on those dinky travel-size containers you buy from Duane Reade that inevitably leak your face wash all over the inside of your bag. And adding onto the stick trend, a multi-use makeup stick is the best way to keep your makeup fresh and easy when you’re traveling. These can be used on your eyes, checks, and lips for a kiss of color that won’t get too heavy in your bag. Pro-tip: bring at least one plain, one-piece swimsuit for the days that you’re not lounging by the pool, but maybe hitting the hot tub at night. You can easily wear a sleek one-piece under a pair of jeans or shorts and call it a bodysuit. Narrowing down eyeshadow looks for a vacation where you’ll be doing a multitude of activities is not how you want to spend most of your day packing. Huda Beauty just came out with small palettes with complete looks for day and night, so you can pick one of these compact ones and call it a day. A button down midi-dress may seem boring, but what it does is open up your travel wardrobe to possibilities. Wear it as a dress, wear it as a duster, cross it in front of your body and tie it in the back, or keep it half-buttoned as a top with jeans. They’re incredibly versatile, even if they seem plain.